Ballpark fare for vegans? Oh yes. Indulge with these vegan Chili Cheese Dogs. Smarter than you think..
Soy is the new milk, coconut water is the new "hydration beverage" and Smart Dogs are the new hot dog. The improved hot dog. The hot dog that you should be serving at all your summer beach BBQ's, camping adventures, birthday parties, picnics in the park and more. If you know someone that loves hot dogs - but hasn't switched over to vegan dogs - forward them this post! 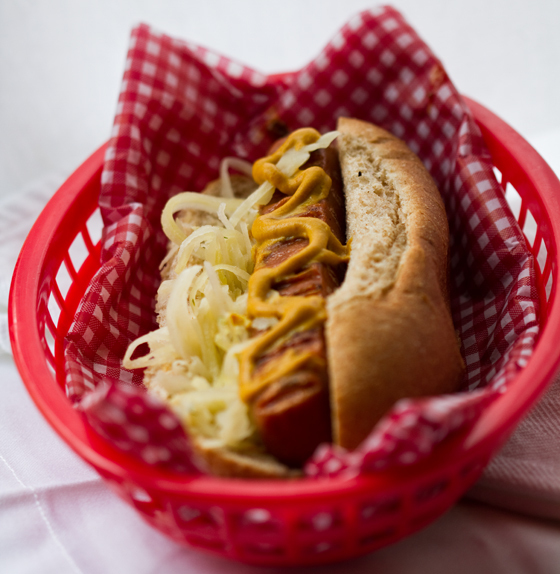 And see why it's incredibly smart - and delicious - to give your hot dog a healthy makeover. Especially important for moms and dads whose kids love hot dogs - and what kids don't?.. Family-friendly Food. 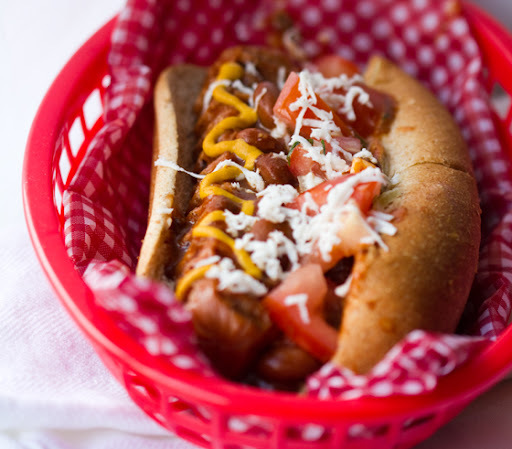 Hot dogs are ridiculously easy, and the whole family can customize their own dog however they choose – and most kids can even add their fave toppings themselves. No fussing over pizza or sandwich toppings. Smart Dog Taste Test. I recently noticed how much my 4 yr-old nephew drooled over his grilled hot dog – and so I wondered why my sister hadn’t tried “Smart Dogs” – aka soy hot dogs. They look exactly like real hot dogs – and when you add your fave toppings – they taste pretty much the exact same. Really. The texture and aroma is identical – and the taste is just about perfect as well. ..So did the kids love the Smart Dogs I made for them? Oh yes! Plus smart dogs are totally nitrate and msg free - and one jumbo sized smart dog (1 link, 76g) contains only 80 calories, 1g fat (0g sat fat), 490mg potassium, 2g fiber, 15g protein, 3g carbs. The sodium is still quite high at 560mg – but I think that salty dog flavor is what gives them the crave-factor. Smart Dog ingredients: water, soy protein isolate, wheat gluten, evaporated cane juice, less that 2%: natural flavor (veg), natural smoke flavor, garlic powder, paprika, yeast extract, xanthan gum, guar gum, carrageenan, fermented rice flour, salt, potassium chloride. ingredients: MECHANICALLY SEPARATED TURKEY AND MECHANICALLY SEPARATED CHICKEN, PORK, WATER, CONTAINS LESS THAN 2% OF SALT, GROUND MUSTARD SEED, SODIUM LACTATE, CORN SYRUP, DEXTROSE, SODIUM PHOSPHATES, SODIUM DIACETATE, SODIUM ASCORBATE, SODIUM NITRITE, FLAVOR. The nutritional facts on one 45g weiner say it all, only 5g protein, 12g fat, 4g saturated fat, 130 calories, 1g carb – and this serving size is 30g less than the smart dog. Summer days are coming, so now is the perfect time to give your hot dogs a smart summer makeover!.. Ready to try a vegan, Happy Day Smart Hot Dog? Here’s what you’ll need..
anything else you like on your dog! I like to grill my smart dogs. You can grill them on an outdoor grill – or even on a stove top grill pan – or my fast way is to grill them on my panini press. Tip: smart Dogs cook very quickly – so don’t over cook them. Enjoy your dogs – and have a happy day!